Apartment for 6-10 persons with swimming pool and garden, on first floor of the family home. The apartment enjoys a magnificent view of Volterra and Pomarance. It has 3 rooms (2 triple and 1 quadruple) all with private bathroom with shower and air conditioning, large living room with kitchen and balcony. Fenced pool for the exclusive use and parking. The perfect accommodation for those wishing to visit Tuscany, central location allows to reach in less than an hour’s drive of the most beautiful cities in Tuscany: Florence, Siena, Pisa, Lucca, Volterra, San Gimignano The house is located near the road linking the Cecina Valley to the town of Volterra. 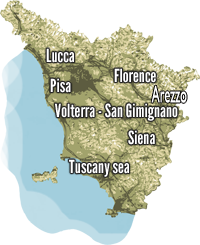 The Etruscan Coast is only 25 km. Guests, have garden, swimming pool, playground, parking, barbecue, washing machine. There is also a wood oven. The rooms are equipped with air conditioning. The owners will greet you upon arrival and their discreet presence will be of help for any need. Price include: towels and linen,m utilities, airco, swimming pool 5mx7m depth 1,5m(opening mid may – mid september). Towels change every 7 days, washing machine, barbeque, wood oven.